What has changed in China? Many if not most in the West haven’t yet caught on because they can’t conceive of where all this might be heading. One literal change was the appointment of Yi Gang as head of the People’s Bank of China. Not only did he replace longtime chief Zhou Xiaochuan, Yi’s elevation broke an even lengthier unwritten Communist rule. Officials with overseas experience aren’t given the top spot in key government divisions. The PBOC certainly counts as one of those. Yet, Yi was appointed, and confirmed, anyway despite his lengthy American sojourn. After graduating from Peking University in 1980, he then moved to St. Paul, Minnesota, obtaining an undergraduate degree from Hamline University. Yi then moved on to the University of Illinois, receiving his PhD in Economics in 1986. While there, he apparently attended a lecture by Milton Friedman. Whatever your thoughts on Friedman, he wouldn’t have been a popular choice of Chinese Communists for future Chinese Communists. If there is a reason any of us including China’s government officials should be concerned about Yi Gang, it is the same one he shares with all the rest of the world’s central bankers. It is spelled out right in his University of Illinois PhD dissertation. I’ll just quote the first few lines of its abstract, more than enough for you to get the picture. This thesis attempts to use Stein type estimators for statistical model selection purposes. First, a parameter truncation criterion developed in conjunction with the new Stein estimator (Stein, 1981) is used in an orthonormal linear statistical model setting, as a basis for simultaneously selecting the model and estimating the unknown parameters. Using a mean squared error of prediction (MSEP) loss measure, the sampling performance of the extended Stein procedure (ESP) is analyzed for two alternative structures of the parameter space and under normal and non-normal errors. Yi is, like all the rest of them, a mathematician. He is the prototypical modern Western Economist who knows quite a lot, it turns out, about statistical processing. Yi’s thesis is actually pretty impressive, just not on the topic most would think. Orthodox Economics is the very essence of technocratic ideals, fitting like a glove onto the 21st century Chinese hand of statist control. Rather, attempts at control. How about economics? There isn’t much to go on in Yi’s case, a lengthy career that tells us nothing about competency in the one area you would think mattered the most. The term Economist has been transformed into something else entirely. Don’t worry, China still has pretty much middle to high growth in the near future. Oh boy. Whether he actually believed it, or whether he was pitching the government’s “nothing to see here” official position, is also a matter for debate. What wasn’t was the PBOC’s often desperate struggles that year (and those that would follow). Why would they do this? 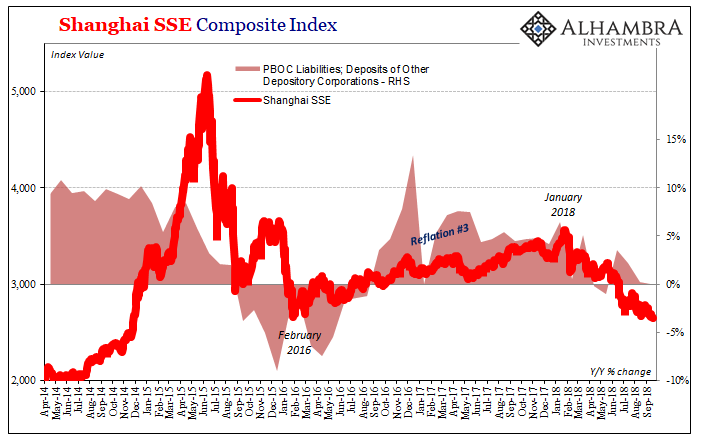 We will probably never know for sure, but I’d bet almost anything it had quite a lot to do with “an orthonormal linear statistical model setting.” The PBOC calculated its other moves would be more than enough margin to offset what it was being forced to withstand in terms of “capital outflows” originating in reversing eurodollar markets. They computed wrong, as usual. But that wasn’t just a one-off event, as the world slowly comes to realize. 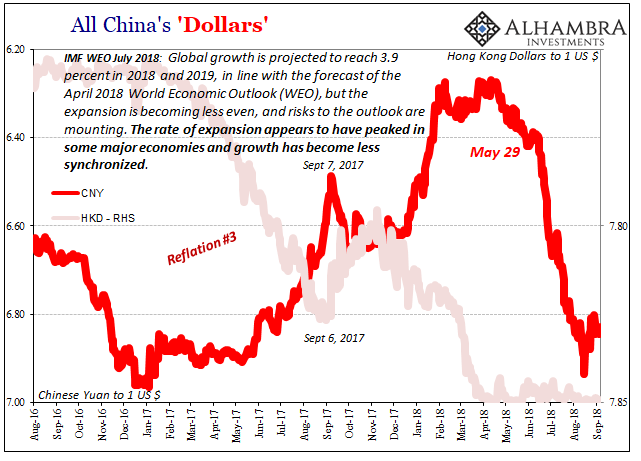 To what I’m sure will be Western media horror, when they find out months or even years from now, Chinese money and currency is once again being squeezed. In terms of currency, growth is for 2018 right back down to almost nothing again. In August 2018, according to the PBOC’s latest figures, total currency was 2.6% higher than the same month in 2017. That’s below the average for this year, 2.7%, and less than the 3.2% growth averaged in all of troubled 2015. In terms of virtual money, like currency bank reserve growth has likewise stopped. Year-over-year, these deposits of other depository corporations were flat in August. It might then appear that something is very different in 2018. That’s not really accurate, though.  What was unusual was 2016-17 – RMB reflation. Ever since 2013, things have been going the wrong way in China, as I wrote in March 2014 (above). 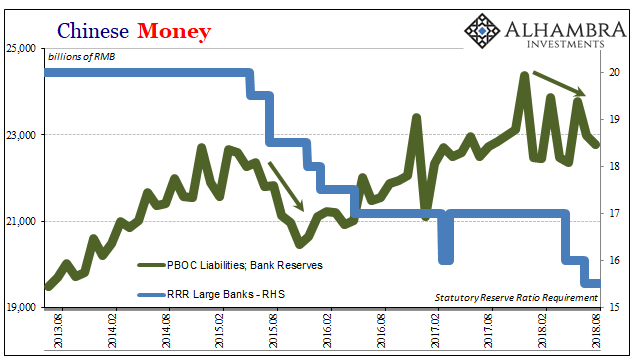 The PBOC has attempted to address this single deficiency in various ways over the nearly five years since then, including RMB “printing” in 2017. All that accomplished was to prove there is no “middle to high growth in the near future.” Forget the myth of rebalancing, so long as the global system remains stuck without meaningful recovery and growth there is nothing China can do about it. Globally synchronized growth was as fake as 2015 models suggesting monetary contraction would be easily handled by China’s economy. This is a hard conclusion for many in the West (and in China, I suppose) to reach. They’ve been taught the technocracy from the very beginning. Give technocrats full autonomy, as they have in China, and watch all the good things they will accomplish. 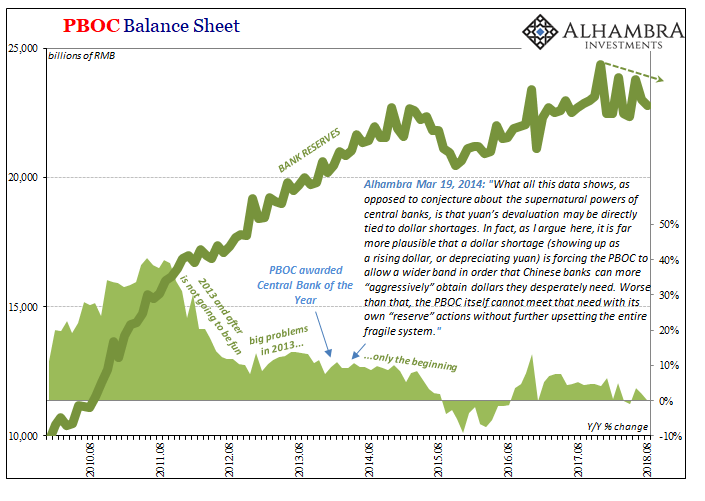 This is why each and every struggle especially on the part of the PBOC is characterized as if it was done on purpose. That’s where we are again in 2018. 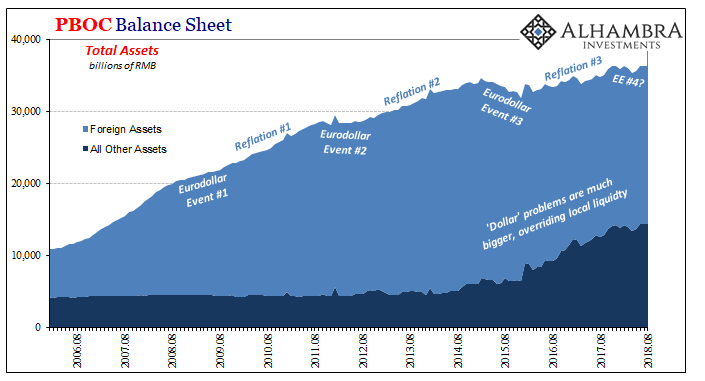 These eurodollar events, as I call them, aren’t picked up in many places, the data on offshore “dollars” incredibly sparse by default. Outside of TIC prepared by the US Treasury Department, the People’s Bank of China, ironically, may be the second-best source. Its balance sheet data very clearly identifies these ups and downs over the last eleven years in a way few others can. 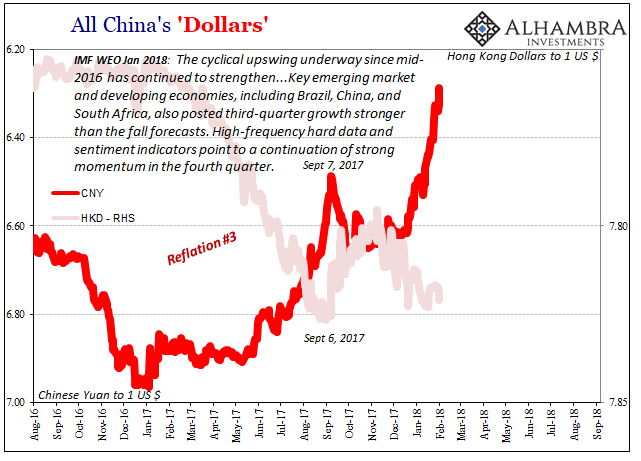 But it goes one step further because it has to; for every “dollar” FX asset that doesn’t appear as a consequence of these global deflationary squeezes, something has to happen on the liability side as a necessary result. It feeds directly into the domestic China economy in ways the PBOC can’t so easily manage – if at all. They can try, and they are still trying (RRR cuts again). 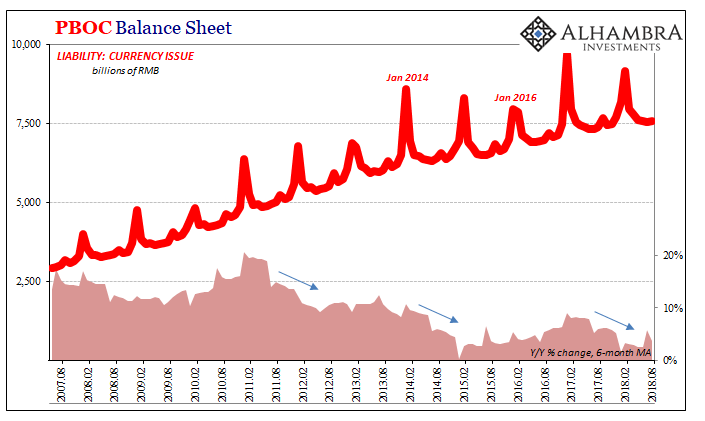 The powerful central bank doesn’t appear all that powerful, rather judging by what’s really going on in all facets of China money central bankers in 2018 once again appear to be desperate. Like 2015 desperate. Because of their models, this isn’t actually different. I wonder if he still feels that way, or if he might understand Zhou’s catlike smirk as he finally walked out the door leaving for his successor this intractable monetary mess. No complex math is required to reach that conclusion.